Today marks exactly one month since the Tohoku earthquake devastated northeastern Japan. One of the side effects of the tsunami that has affected the country as a whole has been its effects on the tourism industry. The Japan Times reported last week that the number of foreign visitors to Japan arriving via Narita airport, Japan's largest, was down 75% in the period from the earthquake through to the end of March. Another article further suggests that domestic tourism is down as well. We planned our Kyoto trip in late February, before the quake hit. At the time it looked like Kyoto would be bursting to the seams with tourists. We couldn't even book a hotel for all three days as every hotel in the city (except for some exclusive ryokan charging way more than we could afford) was booked for the first day. 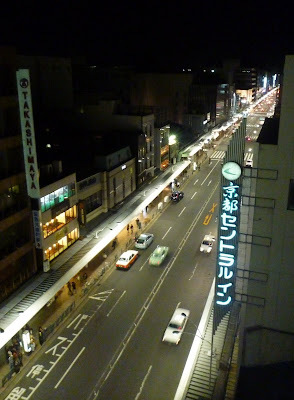 We ended up having to stay our first night in a business hotel in Shin-Osaka. The other two nights we spent at the Kyoto Central Inn (which is a good place to stay, location wise at least). After the quake struck, we weren't sure if we should still go on the trip. Kyoto is closer to, but still quite far from, the disaster area. More than that though, it just seemed unfair for us to be doing something enjoyable at a time when so many people are undergoing so much misery. This is a feeling that has been noticeable all across Japan. This last week saw the height of the cherry blossom season, which is normally Hanami party time in Japan. In my discussions with people around Fukuoka and from watching the news in late March as the season approached, it became apparent that a lot of people were worried about the Hanami season this year. Should they abandon their usual party plans out of respect for the dead or should they go ahead as usual in order to buoy everyone's spirits? Quite the conundrum. In the end, Japan's cherry blossom party-goers, at least in Western Japan, went ahead and had their parties. Kyoto's Maryuama Koen was packed with revelers while we were there, and Fukuoka's cherry blossom hot-spot, Maizuru Koen, was likewise packed this past Sunday when we went for a visit. I won't try to justify our decision to go ahead as planned with some sort of self-serving justification (a-la "we're buying a sofa to support the country" that was the rallying cry of America's monied classes after 9-11). Suffice it to say that we couldn't think of any harm in going and staying home just out of some vague sense of guilt didn't seem right either. So we went. Anyway, back to Kyoto. At first glance, the city seemed its usual self. Loads of tourists everywhere. 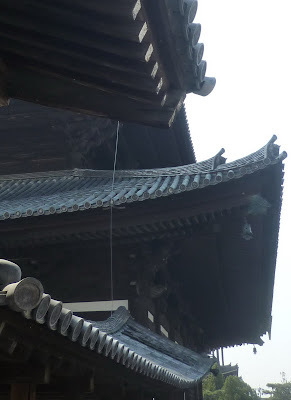 Kiyomizu temple, as usual, was thronged with visitors, as were the streets leading up to it. Some local people we spoke to painted a different picture, however. For 3 of our 4 days in Kyoto we got around on rented bicycles (see future post on this excellent way of seeing the city). The rental place, located just south of Kyoto station, told us that usually during the cherry blossom season they'd be swamped, but not this year. We didn't have any reservations, but were nonetheless able to get our choice of bikes each day just by showing up. They had plenty to spare, even on the sunny Saturday and Sunday that we visited. The Yakitori restaurant that we ate dinner at on our second day was also suffering from the effects of the tsunami. The place was more than half empty when we arrived at dinner time and the waiter told us this was partly due to their having to cut back heavily on the menu items available. This is a problem that seems to affect a lot of restaurants that depend on distribution systems that have been ravaged by the crisis for their ingredients. A lot of the stuff on their menu was simply unavailable because the stuff needed to make it couldn't be procured due to the quake. Other than those anecdotal accounts, its a bit hard to gauge the exact effects of the quake on Kyoto's tourism industry, which might be taken as a good barometer for Japan as a whole as the city is the country's main attraction. While the main tourist district around Higashiyama was packed (as usual) some of the sites slightly off the beaten path that we went to like Ninnaji and Sanzenin were the opposite - at times we almost felt like we had the places completely to ourselves. That may have been just coincidence, though we visited both those places on nice sunny days. Anyway, I may as well end this post by reminding everyone (yet again) that opportunities to help the victims of the quake still exist and any contributions you can make would be greatly appreciated.